The streaming giant easily beat subscriber estimates and also issued strong guidance. That's why markets aren't worried about its plans to burn through $3 billion to $4 billion in cash this year. With Netflix (NFLX - Get Report) having put another blowout quarter on its books, Wall Street isn't batting an eye at the streaming giant's ambitious 2018 spending plans. Netflix reported Q4 revenue of $3.29 billion (up 33% annually) and GAAP EPS of $0.41, nearly in-line with consensus estimates of $3.28 billion and $0.41. More importantly, the company reported it added 1.98 million U.S. and 6.36 million international streaming subscribers, easily topping guidance of 1.25 million and 5.05 million. 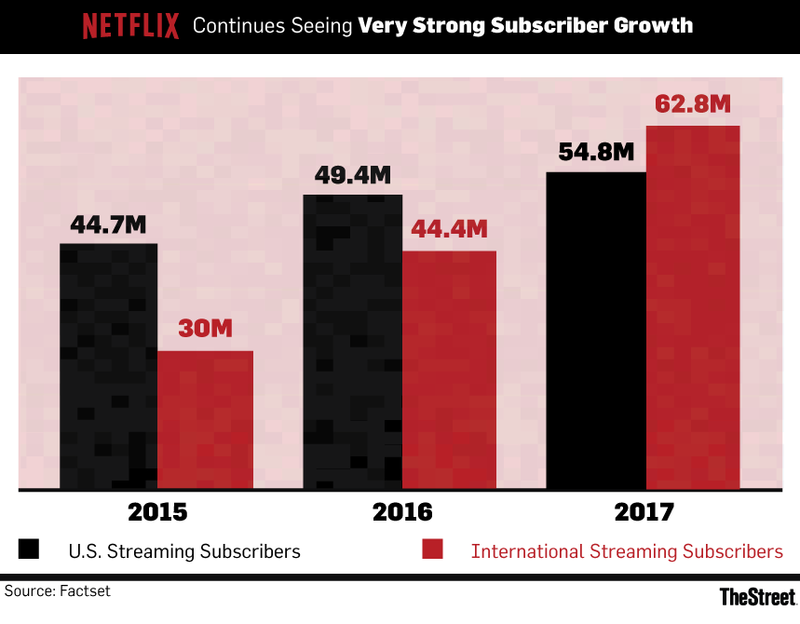 In addition, Netflix guided for 1.45 million U.S. and 4.9 million Q1 international streaming net adds, above consensus estimates of 1.26 million and 3.76 million. And thanks to both subscriber growth and rising average selling prices (ASPs), it's guiding for Q1 revenue of $3.69 billion (up 40% - the strongest growth seen in recent years) and EPS of $0.63, above consensus estimates of $3.49 billion and $0.54. Shares rose 8.3% in after-hours trading to $246.50, taking out the highs they made in regular trading on the back of a 3.2% gain. Based on its after-hours close, Netflix now sports a $106 billion market cap. As expected, Netflix (in spite of having positive EPS) continued burning cash in Q4, thanks largely to its giant content investments. Free cash flow (FCF) was negative $524 million, leading full-year cash burn to total negative $2.02 billion. That was actually near the low end of a guidance range of negative $2 billion to $2.5 billion, something attributed to the push-out of content payments into 2018. And in spite of its tremendous top-line growth, Netflix expects its cash burn to be within a range of negative $3 billion to $4 billion this year, spending that will lead it to once more tap debt markets. Massive content spend is of course the biggest culprit here: Netflix now expects to spend (on a profit-and-loss basis) $7.5 billion to $8 billion on content in 2018. That's revised from prior guidance of $7 billion to $8 billion, and well above a 2017 level of $6 billion. In addition, on the earnings call, Reed Hastings stated (to little surprise) that content spend will also rise in 2019 and 2020. It shouldn't be long before Netflix's streaming content obligations, which grew by $700 million last quarter to $17.7 billion, surge past $20 billion. Netflix is also dialing up its spending in other areas. Marketing spend, which rose 29% in 2017 to $1.28 billion, is forecast to rise 56% in 2018 to $2 billion; Netflix suggests it's quite pleased with the payoff it got from heavy Q4 ad spend, and considers it grounds for spending even more. Technology & development (R&D) spend is forecast to grow 23% to $1.3 billion, as Netflix keeps spending heavily on optimizing its apps and content for dozens of countries, screen sizes and connection speeds. As the after-hours gains show, markets don't seem bothered by all this spending, at least not while subscriber growth remains torrid. Much like Amazon.com (AMZN - Get Report) and Facebook (FB - Get Report) , Netflix's execution has helped earned it a green light to make giant cash flow-depressing investments. Here, it also doesn't hurt that the company had just $3.7 billion in net debt at the end of 2017, a figure equal to less than 4% of its current market cap. One does have to wonder, though, to what degree Disney's (DIS - Get Report) plans factor into Netflix's budgeting. Over the last five months, the media giant has unveiled plans to pull ts films from Netflix at decade's end, launch a Disney-branded streaming service in 2019 that will be the exclusive home of Disney, Pixar, Marvel and Star Wars films and inked a deal to buy most of Twenty-First Century Fox's (FOXA assets for $52.4 billion. All of that gives Netflix fresh incentives to spend more on both content and customer acquisition ahead of the Disney service's launch. But if Hastings is worried about Disney's moves, he's not signaling it. On the call, he predicted the Disney service "will be very successful" and even declared he'd sign up for it just as "many Disney and Fox executives also subscribe to Netflix and watch our shows." But Hastings also declared the Disney service no more of a threat to Netflix than Hulu (set to be majority-owned by Disney) is, and reiterated that Netflix only streams Disney films today in a handful of international markets (namely, Canada, The Netherlands and Australia). And as Q4 results and Q1 guidance show, business is very much booming overseas in the absence of much help from Disney. Netflix ended 2017 with 62.8 million international subs, up from 44.4 million at the end of 2016 and just 30 million at the end of 2015. And with penetration in many big European, Latin American and especially Asian markets still fairly low, there's a lot of room to keep growing. Things aren't looking too bad in the U.S. either: Netflix's domestic streaming grew by 5.3 million to 54.8 million in 2017, and the Q4 subscriber adds suggest the company's October price hike -- it only covered the U.S. and certain European markets -- was generally taken by subscribers in stride. CFO David Wells confirmed quite a few suspicions on the call when he said that Netflix was "a little conservative" with its Q4 guidance due to the price hikes. And not only did subscribers grow in 2017, so did engagement: Netflix, fairly tight-lipped about sharing viewing data, disclosed that its per-user viewing rose 9% last year. The disclosure comes nine months after Netflix said its subscribers, which at the time totaled 99 million, were collectively watching over 1 billion hours of video per week. Heavy marketing spend did help boost Q4 subscriber adds, but so did a strong content slate featuring Season 2 of Stranger Things, the Will Smith action/sci-fi film Bright (apparently better-received by Netflix viewers than by critics) and a slew of foreign-language original series'. Partnerships with carriers and pay-TV providers -- some feature service-bundling deals, while others just involve integrating Netflix with pay-TV set-tops -- also helped. Netflix's deal with T-Mobile US (TMUS - Get Report) to have its HD plan included with subscriptions to postpaid T-Mobile unlimited plans is especially noteworthy. On the other hand, assuming that T-Mobile got a discount for providing Netflix to many millions of subs, the deal might have kept a lid on Netflix's U.S. ASP growth, which was only 5% on an annual basis in spite of the price hikes. Netflix's international ASP, benefiting from both the latest price hikes and ones carried out earlier in 2017, rose 12% excluding currency swings. On the whole, Netflix's quarter provided additional evidence that its formula for success, with its emphasis on leveraging superior scale to make giant original content investments and leveraging superior data to both fine-tune what viewers are recommended and guide new content investments, has made the company all but bulletproof in a very competitive streaming landscape. At least as long as its content bets keep paying off at a decent rate. And until Wall Street feels differently about Netflix's formula or its execution against it, it isn't going to be troubled by all that cash burn. TheStreet's Eric Jhonsa previously covered Netflix's earnings report and call through a live blog.